Since RAID 1 is very popular among Windows Server users, this article is aimed at discussing how to backup Windows Server RAID 1 drive and why we need to do so. We hope you will find it a helpful resource. 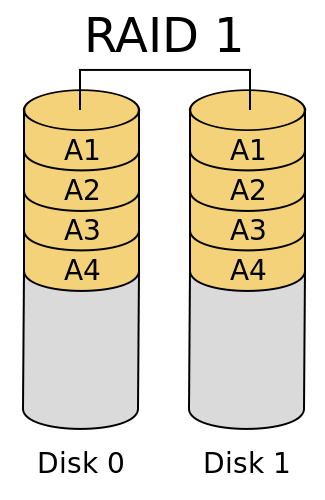 Detail: By using mirroring, RAID 1 writes data to several drives simultaneously. That is to say, the files which you are writing will be saved to two different disks at the same time. The advantage of doing this is that, if one of the drives fails, you still can read and use those data from the mirror disk drive. Advantages: Advanced writing and reading performance; protect data by making a duplicate for the source data. Disadvantages: The cost per array is too high; since all data are copied, double storage space is necessary. As computer user we all know that, RAID 1 is most commonly used among medium and small business users, in other words, RAID 1 is more popular in Windows Server users, and consequently, there is a big chance that we stored our valuable business information, classified license code, paid software and the like in the RAID 1 disk. Unfortunately, our computers are entirely vulnerable to many unknown accidents, such as software/hardware conflict, system crash, disk fails or virus attacks. Although RAID 1 has the ability to mirror one drive to another, but it still under the risk of disk fails and virus attacks. To backup Windows Server RAID 1 safely and trustingly, we need to backup our RAID 1 drive by using professional backup software, for instance, AOMEI Backupper. Backing up your operating system or even the whole disk is very important, because you can easily regain your operating system and all of the data by restoring those backup image files. Take AOMEI Backupper for example, this software provides three major backup modes, namely, System Backup, Disk Backup and Partition Backup, users are free to choose any one of them to do backup operation. If you create a backup image file for your computer before those unwanted accidents happening, you can simply restore your system to its prior normal state without reinstalling. It is no exaggeration to say that, AOMEI Backupper is the optimal choice for RAID 1 backup. This is a professional freeware which permits you to one-click backup operating system; it also offers functions to do compression and encryption for your backup tasks. In a nut shell, AOMEI Backupper offers a wise strategy for backup missions. The detailed steps to realize free backup Windows Server RAID 1 drive without data loss please refer to: How to Backup Disk for Windows PC and Server?